Ikat, Youkat, we all scream for Ikat. 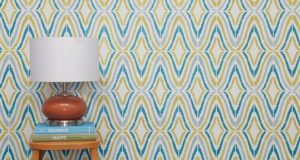 Well, maybe not, but Ikat patterns have remained so popular over the last few years I think it’s time to declare them an official pattern staple. But just because something is “common” doesn’t mean you can’t find new ways to reinvent it. 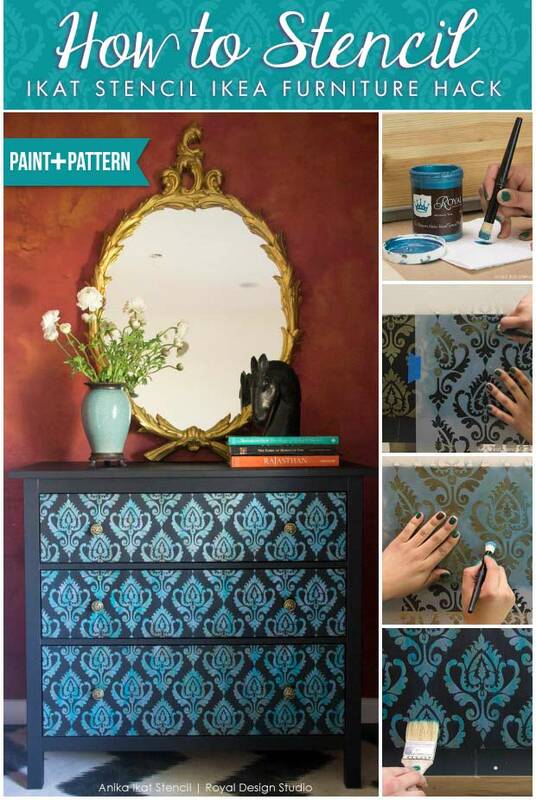 Take this Ikat Stencil IKEA Furniture Hack how-to, for instance. Instead of the usual neutral or bright colors on white, we’ve chosen to spice it up a bit with some hot metallic colors on black. 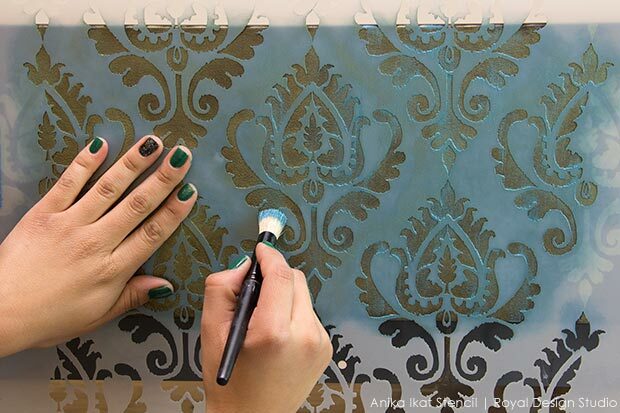 Mmmmmm…..This is a super fast and fun stencil technique you can adapt to different color palettes, and it would look just awesome as a wall as well as furniture finish. 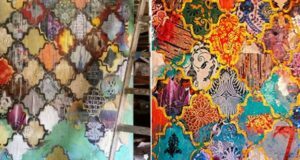 We are going to apply the stencil paint a teeny lit bit heavier than usual and then drag through it to create that characteristic “bleed” effect that Ikat fabric patterns are known and loved for. Read on to see how easy it actually is…. 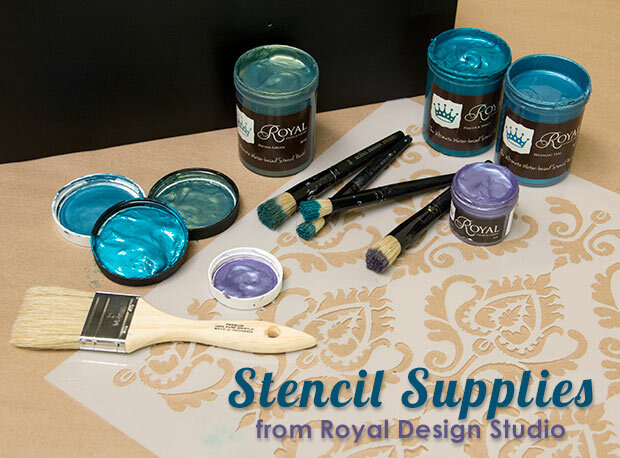 Stencil Creme paint from Royal Design Studio: Patina Green, Metallic Teal, Peacock Fancy, Frosted Lilac. Painter’s Tape, Paper Towels, Measuring tape, Foam Roller Set, Chip Brush. Stencil Project Prep: Use 200-grit sandpaper to lightly sand the Hemnes chest allover. Wipe with a damp cloth to remove any sanding dust and let dry. 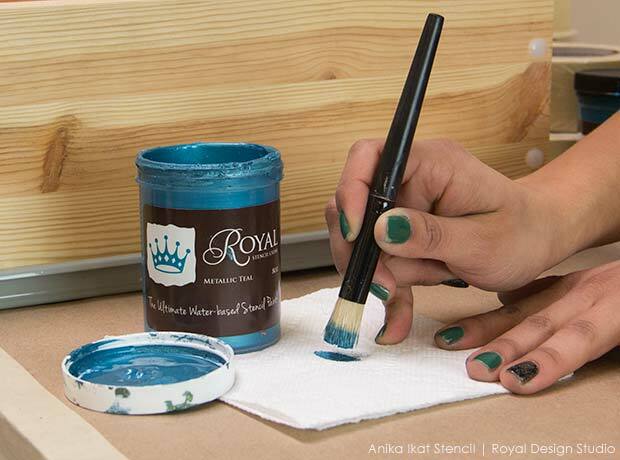 Use a foam roller to paint with 2 coats of a black “Paint + Primer” latex paint. Allow to dry. 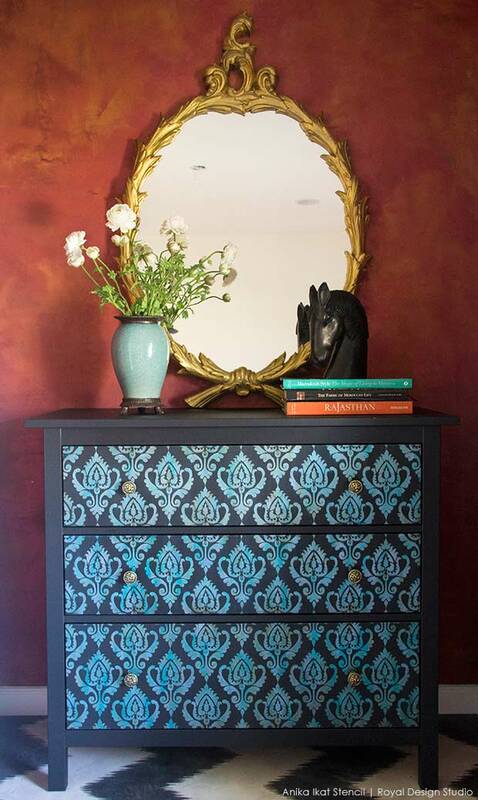 Step 1: Find the center of the drawer, and center a full Ikat stencil repeat there. Secure in place using a few pieces of Painter’s Tape. Step 2: Load just the tip of a 1 ½ “ Stencil brush with Patina Green Stencil Creme and offload excess paint by swirling onto paper towels. Stencil the whole drawer with the Ikat pattern, using a swirling motion and filling in the design with solid, even color. Follow the built-in window registration marks to repeat the pattern perfectly across each drawer. Step 3: Once all of the drawers have been stenciled with the Ikat pattern in Patina Green, re-place the stencil over the first repeat you started on each drawer. 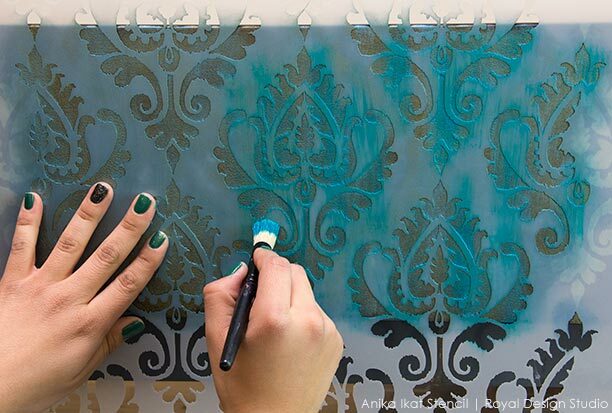 Load a ½” stencil brush with Metallic Teal Stencil Cream. Lightly off-load just a little bit of excess of Stencil Creme by dabbing your brush on a piece of paper towel. Drag your stencil brush vertically up and down through the stencil pattern here and there to create a random stripe effect with the color. 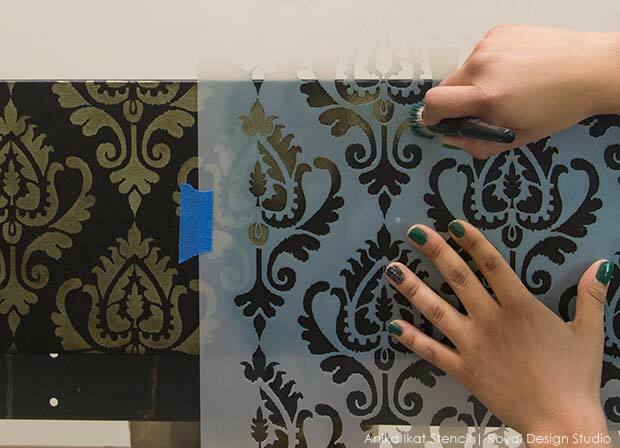 Tip: For THIS technique it is important and actually desirable to have some excess Stencil Creme paint build up around the edges of the ikat stencil. You will see why in Step 6! 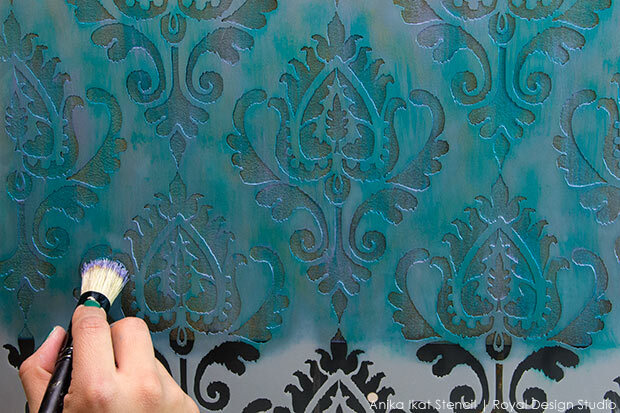 Steps 4-5: Repeat this step using clean stencil brushes with Peacock Fancy and Frosted Lilac Stencil Crèmes. Step 6: After completing a small area, remove your stencil. It is important to do this next step before the Stencil Creme dries completely. Drag a clean and dry Chip Brush up and down vertically through the pattern using a light to moderate pressure. This will pull the excess Stencil Crème out a bit into the background and create the look of the color bleed that is inherent in actual ikat fabric. 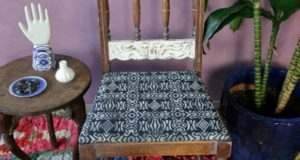 You can better see the Ikat fabric effect that you get by dragging the chip brush through the slightly wet stencil creme above. 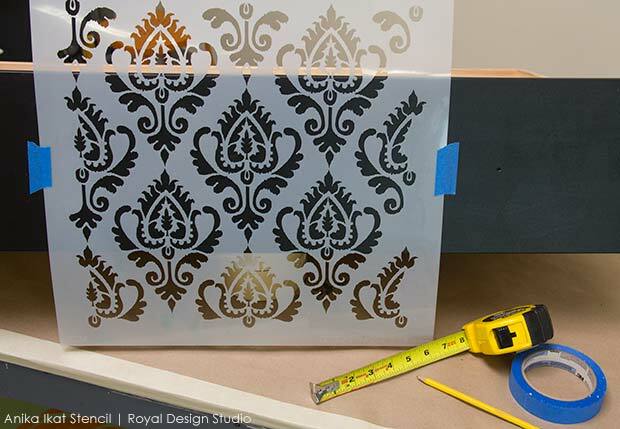 With its simple design and flat front, the IKEA Hermes dresser is a PERFECT for a furniture stencil treatment. 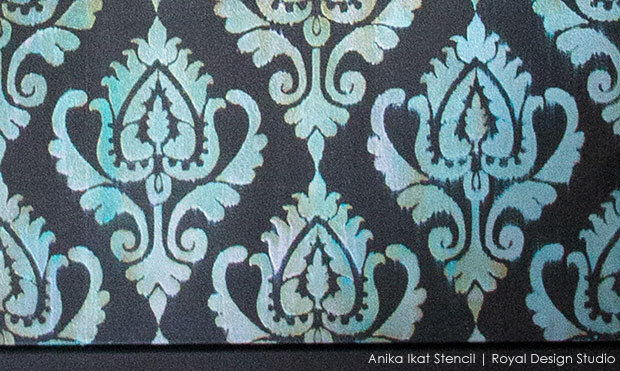 The curvy shapes of the Ikat stencil pattern help to soften the straight lines and the use of metallic Royal Stencil Creme paints provides a bit of unexpected glamour. What do you think??? Let us know in the comments below! Love Ikat patterns but looking for a more traditional look? 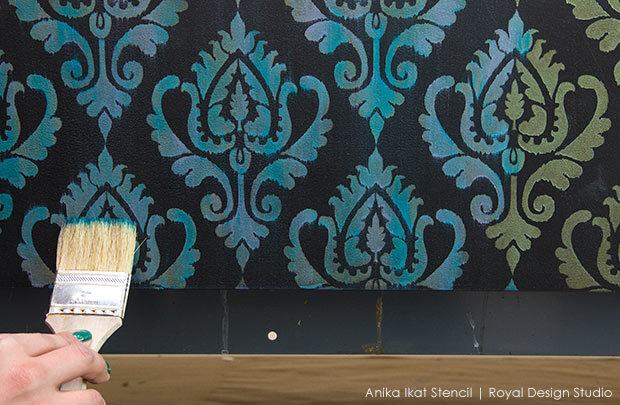 Check out this post on how to stencil an Ikat fabric look with Chalk Paint. What’s up it’s me, I am also visiting this website regularly, this website is actually pleasant and the people are trulysharing fastidious thoughts.